I stopped by the local market a couple days ago in search of some fresh fish. I was in the mood for bass but couldn't find it at the fishmonger. Montreal is a strange city when it comes to fish and seafood. Growing up in Paris (which isn't exactly a maritime city) I was used to the great abundance of local markets and the easiness to find great varieties of fish at anytime of year. Montreal, for a reason that I have yet to discover, offers very little variety of fish in most places, and what is offered is quite expensive. Frustrated at the sight of the fish available, I settled for calamari. I found grilling calamari to be quite the experience. Being not incredibly awake while making lunch, I attempted to gently place the calamari on our indoor grill. The tentacles danced to the sizzling oil, and, for a second, I thought it might still be alive. Fortunately for me, it wasn't. I was clearly in no mood for a fight. 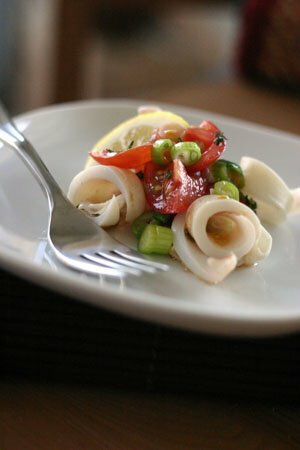 It's surprising how easy, and quick, it is to cook calamari. It must, actually, be cooked in a couple minutes to prevent it from becoming tough and chewy, so it's really an easy solution for a quick meal. Slit the calamari tubes on one side to open them up, and lightly score one side. Place them in a bowl and add half the lemon juice, the zest, the garlic, half of the thyme, salt and pepper and a good drizzle of olive oil. Leave to marinate while you make the tomato salad. Quarter the tomatoes and place them in a bowl. Add the sliced scallions, the rest of the lemon juice and the rest of thyme. Drizzle with olive oil and adjust the seasoning with salt and pepper. Get your grill on medium high heat. Once it's hot, place the calamari on the grill. gently pressing down so they don't curl up too much. After 1 minute turn them around. Make sure to pour the extra thyme and garlic over top. Cook for another minute. Remove from the heat and slice in bite-size pieces. Add to the tomato salad and toss. Adjust seasoning. Enjoy!